What is Avamys used for? 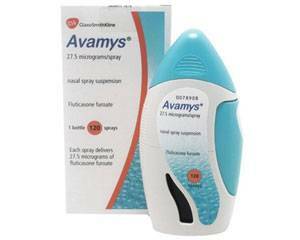 Avamys is a nasal spray and its most important active ingredient is fluticasone furoate (a medication from the group of glucocorticosteroids). This medication ensures that inflammatory reactions of the nasal mucous membrane are reduced. Avamys is prescribed by doctors for allergic rhinitis: a condition in which the patient is suffering from a runny and / or stuffy nose, sneezing, itching of the nose and / or eyes, watery and / or red eyes. Allergic rhinitis may be caused by hay fever or allergies to pets, dust mites or certain fungi. The symptoms may be seasonal, but some people suffer chronically. Avamys fights the allergic reaction of the nasal mucosa thereby reducing the symptoms of allergic rhinitis. You usually notice an improvement of symptoms within a day. Avamys nasal spray should be administered daily at a fixed time. Shake the nasal spray before use. Aim the nozzle of the sprayer, during the administration of the nasal spray, as much as possible to the outside of the nostril (so not toward the nasal septum) and inhale the liquid well. That way the medication will end up at the right place. A complete overview about the use of the nasal spray can be found in the leaflet. After opening the Avamys nasal spray it can be stored for two months. Do not store Avamys in the refrigerator or freezer. Adults and children over the age of 12: once daily 2 sprays in each nostril. Children between 6 and 12 years: 1 spray in each nostril once daily. Avamys is not suitable for children younger than 6 years. You can take a missed dose, unless it is almost time for the next dose. Never take an extra spray of Avamys to compensate for the missed dose. In the leaflet you can read all about any contraindications, warnings and side effects. The use of Avamys is not recommended for women who are pregnant or want to become pregnant, or are breastfeeding. Talk with your doctor about the use of a drug that you are able to use safely.